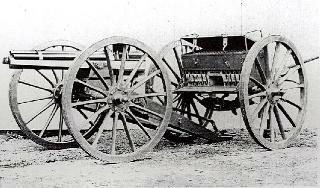 The light Field Service 37 mm Hotchkiss Revolving Cannon is the same pattern of gun as the naval version and is mounted on a carriage. 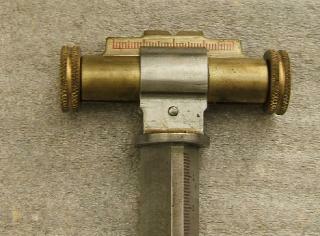 The shoulder-piece is not necessary, and the crank is mounted on the side as in the Gatling gun. It has 37 mm calibre (1.45 inch), and weighs 200 Kg (4 cwt). It fires a projectile of 480 grams, with 80 grams of Curtis and Harvey’s No. 6 powder it attains an initial velocity of 370 metres/sec (1,210 feet/sec), and a maximum range of 4,400 m (4,800 yards). 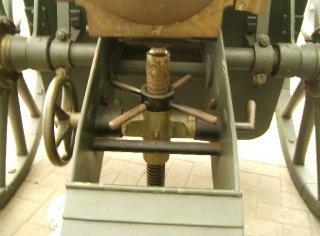 Traversing the gun using hand-wheel moves the elevating spindle left or right. Feed case for land service. Each case contained 10 rounds which are locked in position by the catch at lower right. Toolbox in trail of carriage. 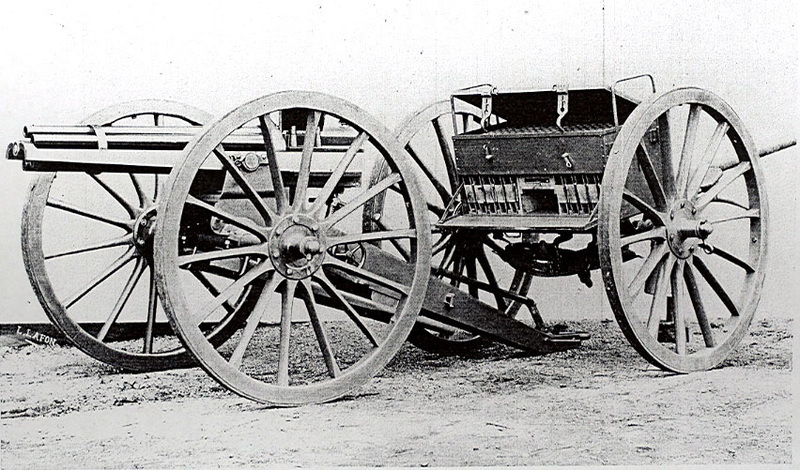 A light steel carriage has been constructed for this gun, with elevating and a lateral training apparatus, and brakes for suppressing the recoil. 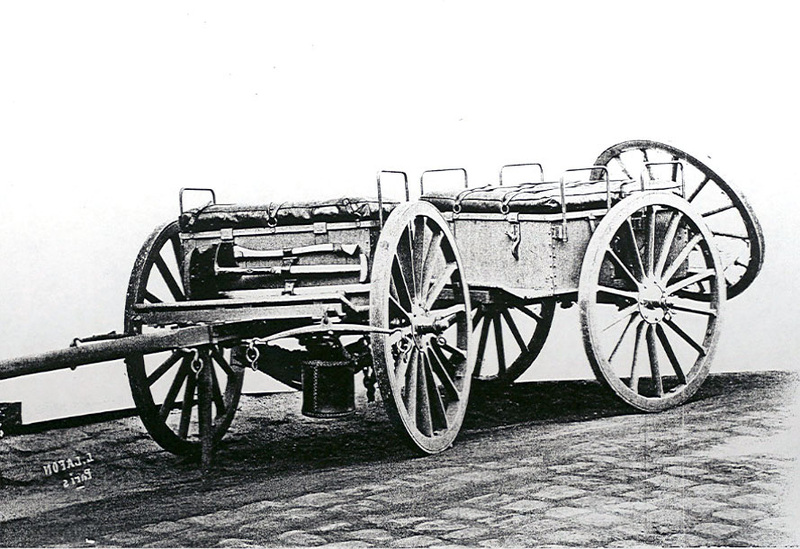 The carriage weighs 255 Kg (5 cwt. 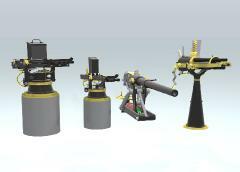 ), and the gun, with carriage, limber, and all accessories, and 300 rounds of ammunition, weighs altogether 1425 Kg. (28 cwt). This pattern is particularly adapted for countries where roads are bad and transport is difficult. 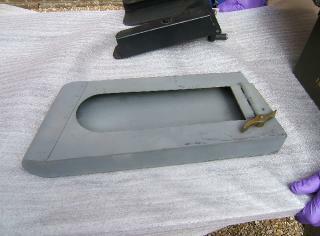 The limber, shown above, contained 10 compartments for ready-charged feed-cases, and a further 200 rounds as reloads. "As each shell of the revolving cannon gives in the mean, on bursting, ten fragments of between 40 and 70 grams (1.5 and 2.5 ounces) in weight, besides twelve smaller fragments which are also capable of doing considerable damage to men and horses, this gun is capable of delivering a continuous fire at the rapidity of at least 60 shells per minute, giving 60 dangerous zones of explosion and divided into a hail of about 1,300 fragments of sufficient power to put men, horses and matériel, hors de combat. 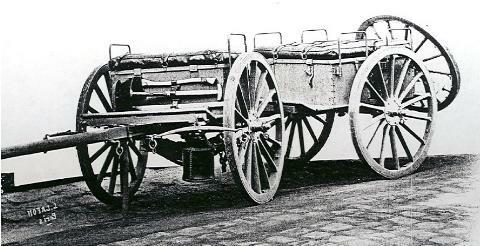 Once positioned on the field, the carriage wheels are locked using recoil-brakes on the axle, operated by short levers just inboard of the wheels. Since the gun does not recoil, it does not have to be repositioned after each shot as normal artillery of the period would have needed. 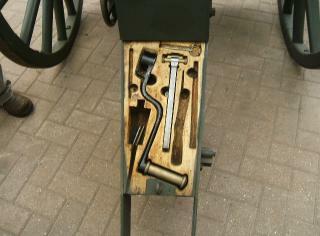 Instead the gunner can adjust the elevation using a screw, and train the gun laterally by up to 4 degrees using the brass hand-wheel on the left, which pivots the gun in a cradle attached to the carriage. The gun would often have a light steel shield to protect the gunners from small-arm fire. A toolbox built into the trail contains the hand-crank, rear-sight, screw-driver, oil can, spare main-spring, spare firing-pin, spare extractor hooks, hammer, punch and a universal wrench. The Heavy land-service Revolving Cannon has the same calibre at 37 mm (1.45 inch), but the projectile and charge are heavier; this gun weighs 460 Kgs (9 cwt. ), its total length is 1.9 m (6 feet 8 inches). The barrels are 34 calibres long. The explosive shell weighs 550 grams (19 oz. ), and it attains an initial velocity of 458 m/s (1,502 feet/sec), with a charge of 112 grams (3.8 ounces) of powder. The maximum range is 5,000 m (5,500 yards). This pattern was adopted by Brazil and the United States; China and Turkey also had a small number of them. They were used in the United States by General Miles in the 1879 Indian campaign; the effect of their fire upon the Indians, according to his report, was very demoralising.